was very easy to find my phone case on this site very easy to buy and nice quick delivery even got my mum to order her case for her new phone ???????????? I like that the phone cover is thin and lightweight. 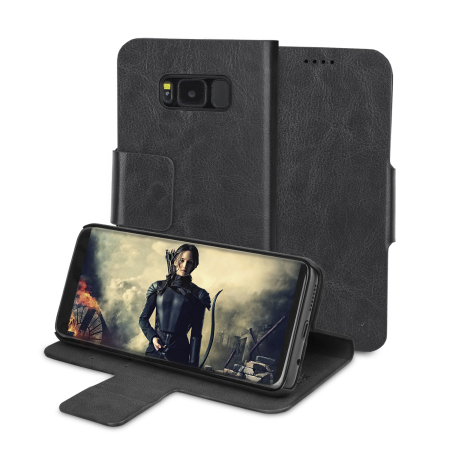 S8 smartphone but my phone falls out of this case. So being s8+ is wider would fit not worth the time or postage to return so when buying a case for your phone go to a shop where you can try the case on your phone. Seems to be good value for the price. Fits phone perfectly and is nicely made. Smart case which arrived quickly and was not too expensive. Can't go wrong! A very stylish and smart cover that holds a few cards - just what he wanted! He is very pleased and not being black makes it easier to find. This broke in 2 days..The plastic frame...Not at all expected! Did you have any problems with this case? If so, can you please contact us so we can investigate. Bought cover as a gift for hubby. Didn't realise there was difference in size between S8 and S8+ so found out that size really does matter!!! Great product though and arrived on time and in tiptop condition. Quick delivery very good quality and at a very reasonable price. Dose exactly what it says on the tin. The Olixar leather case I purchased ticks all the right boxes for me, it is sleek, light, stylish but most importantly protects my phone, I love it! With a phone as sleek and elegant as the Samsung S8, you need to keep such an item in a safe and elegant case. The Olixar leather style case is an ideal choice to protect your phone. The case is soft and feels like leather, holds the phone nicely in place, with access to all the connections and buttons. Easy to fold into a stand to watch those video's. Closes nicely with the magnetic catch, to protect your screen. Samsung Galaxy S8 ordered. Thought I'd order a case for it too. Product just as detailed on the Mobile Fun site. Excellent quality.